It’s time to tackle an issue that affects every petition, regardless of the topic: promotion and awareness. Now that we’ve developed our petition and identified our targets, we need to get the word out. Share your petition with your circle of influence. Attract signers to your petition. Encourage the signers of your petition to share it forward. Read on for road-tested tips from our staff to get the most mileage out of your efforts. Online petitions are beautifully built for easy sharing! But it’s important to appreciate the nuances of each sharing channel. Make your Facebook posts ‘public,’ so that when your friends like the post or offer comments, it will automatically be posted for their friends to see. 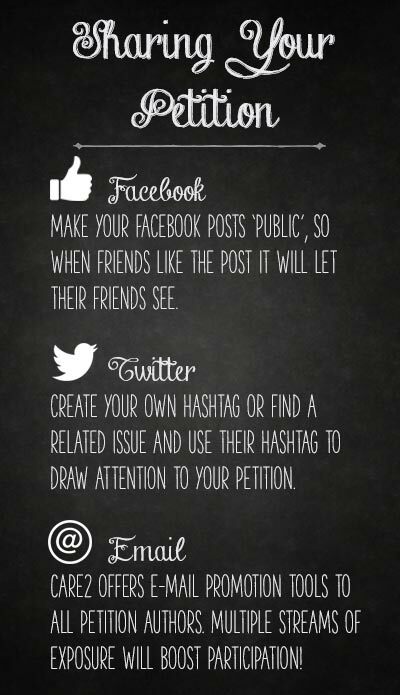 Twitter harnesses the power of #hashtags, so create your own hashtag or find a related issue and use their hashtag to draw attention to your petition. Care2 offers e-mail promotion tools to all petition authors. Make sure to include a link in the e-mail to the petition itself, as well as easy links for people to share your petition via Facebook and Twitter. Multiple streams of exposure will boost participation! Get in touch with a reporter at your local newspapers and TV stations, which are often eager to cover local activism efforts. When speaking to media, be ready to talk enthusiastically and informatively about your cause and petition. Host a public event at a local restaurant, coffee shop or park to gather supporters together and create momentum. Be honest with signers about who will see their signature. Emphasize that their signature and support can truly make a difference. And be prepared for difficult questions and challenges to your efforts. Respond with calm and focused talking points. Encourage your new supporters to become owners of the cause. Their help extends beyond their physical or online signature — ask them to help with e-mail, Facebook, and Twitter promotion to reach a wider audience. Our online petitions make that easy to do! Alert your current and future supporters of developments in the situation. This will prompt them to share again through their online profiles. Posting each day (or even weekly) on Facebook or Twitter gives people multiple opportunities to learn more about your cause and why it matters to them, as well as what they can do to bring about change. Your issue is worth sharing. Take every opportunity available through social media and traditional methods to get the word out! Use your own creativity to bring the issue to your friends and family. Your passion and enthusiasm can spur small ripples of support locally, and through promotion and awareness can grow into tidal waves regionally and even nationally!